Well, despite the best efforts of My Brain, I have been back at the gym for just over three months now. One week I only made it five days, but then another week I went all seven days (on the seventh one I just did Pilates, so don't worry, I'm not over-doing it). I'm doing pretty well at building this back into a habit. However, I'm starting to get a familiar feeling that I often get right before going to the gym gets a lot harder: a sense of futility dusted with humiliation. I'll have just finished a vigorous workout on the elliptical trainer, burning a whopping 641 calories in 60 minutes, and I'll feel pretty good about myself. Then I head to the mats to stretch so that I won't be crippled the next day. Other people at the gym stretch forward to touch their toes, and rest their heads on their ankles as though it's the easiest thing in the world. On a good day I might manage to sit up with my back straight and wiggle my fingers in front of me, but my toes might as well be on the other side of the room for all the chance I have of reaching them. Something inside me tells me that it would feel really good to stretch deeply. That if I could pull my body into those positions it would relieve a world of tension, both physical and mental. But my body can't do that, and My ADD Brain is decidedly unhelpful in my efforts to improve myself by stretching more. As if my lack of flexibility weren't bad enough, my coordination also leaves something to be desired. This was brought rather glaringly to my attention one day a few years ago when I attended a step aerobics class. 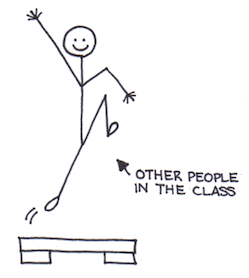 Everyone else in the class was doing these energetic leaps straight up off of their steps, full of stamina and competence. The fact that my new gym doesn't offer step aerobics is probably a blessing in disguise. I'm not giving up, and I will continue to attempt to stretch, and to do my best not to trip over things (like my own feet) and injure myself. But it is very frustrating, and more than a little embarrassing -- because if I can see the other people at the gym and admire and envy them, then they can also see me; and the least offensive emotion I can picture them feeling is pity. But I'm sticking with it. I'm trying to remember not to compare my beginning to someone else's middle. And who knows? Maybe one day I'll be able to fold myself in half.